In the summer of 1995, one question consumed an entire nation of TV viewers: Who shot Mr. Burns? The two-part cliffhanger finale of The Simpsons’ sixth season was originally conceived as a parody of similar publicity stunt finales— specifically the “Who Shot J.R.?” cliffhanger on Dallas—but it soon took on a life of its own, as fans toiled over theories about various Springfield residents. In the end, the shooter was revealed to be Maggie Simpson, with an assist from Burns himself as he attempted to steal the innocent baby’s candy. 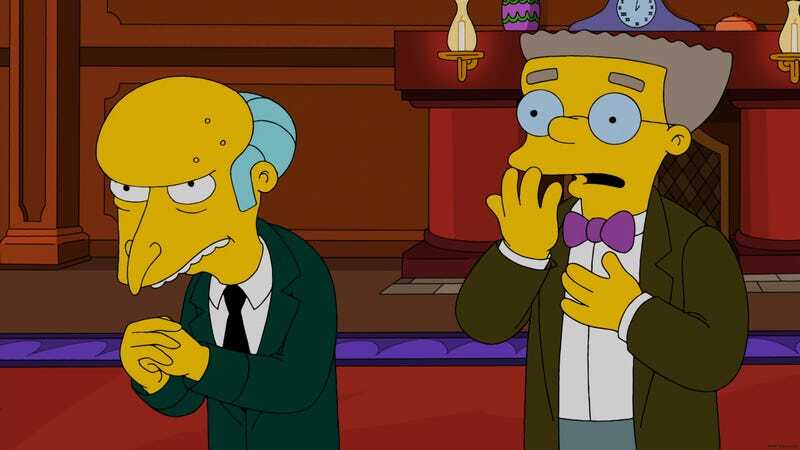 But, as veteran Simpsons writer Josh Weinstein revealed on Twitter today, the original ending to “Who Shot Mr. Burns?” was going to be quite different. “This is very rough. The story has to basically be about Mr. Burns making six mortal enemies.” Thus begins the episode pitch summary from a writers’ conference in June 1994 where Bill Oakley and Josh Weinstein pitched their original idea for the two-part episode. Initially, the vile scheme Burns’ concocts that inspires hatred from Springfield’s citizenry was going to be a much simpler land deal in which he would “buy this block of downtown area and demolish it,” effecting the lives of various characters. This later turned into the more super-villain-esque idea of blotting out the sun with a giant dish. Regardless of who he angers or how, the finale ends with Burns being shot. One common element that’s present in the above snippet as well as the original pitch is the idea of leaving clues for the audience. These consciously placed breadcrumbs are part of what make the “Who Shot Mr. Burns” episodes so great. In the end, it didn’t really matter who held the gun. It was the mystery that made it so fun to watch.